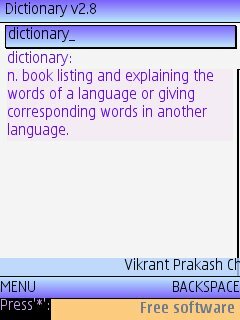 Dictionary is a must-have tool for every student. Unlike its classic book or PC version, Mobile dictionary can be carried anywhere. There are some very good free mobile dictionaries available for Mobile phones. One such application is Dictionary v2.8. It is a free mobile dictionary and does not require any internet connection. 1680c, 2355, 2600 classic, 2610, 2626, 2630, 2650, 2660, 2680, 2760, 2855, 2855i, 2865, 2865i, 3100, 3105, 3109 classic, 3110c, 3120, 3120 classic, 3125, 3152, 3155, 3155i, 3200, 3220, 3230, 3250, 3300, 3410, 3500, 3510, 3510i, 3530, 3555, 3586i, 3587, 3595, 3600, 3600 slide, 3620, 3650, 3660, 5000, 5070, 5100, 5140, 5140i, 5200, 5220 XpressMusic, 5300, 5310 XpressMusic, 5320 XpressMusic, 5500, 5610, 5700, 5800 XpressMusic, 6010, 6015, 6020, 6021, 6030, 6060, 6060v, 6061, 6070, 6080, 6085, 6086, 6100, 6101, 6102, 6102i, 6103, 6108, 6110 Navigator, 6111, 6120, 6120c, 6121 classic, 6125, 6126, 6131, 6133, 6151, 6152, 6155, 6165, 6165i, 6170, 6200, 6210 Navigator, 6220, 6220 Classic, 6225, 6230, 6230i, 6233, 6234, 6235, 6235i, 6255, 6255i, 6260, 6265, 6265i, 6267, 6270, 6275i, 6280, 6288, 6290, 6300, 6301, 6310i, 6500c, 6500s, 6555, 6585, 6600, 6600 slide, 6610, 6610i, 6620, 6630, 6650, 6651, 6670, 6680, 6681, 6682, 6708, 6800, 6810, 6820, 6822, 7070, 7200, 7210, 7210 Supernova, 7250, 7250i, 7260, 7270, 7360, 7370, 7373, 7390, 7500, 7510 Supernova, 7600, 7610, 7610 Supernova, 7650, 7710, 8600 Luna, 8800, 8800 Sirocco, 8910i, 9210, 9290, 9300, 9300i, 9500, E50, E51, E60, E61, E61i, E62, E65, E66, E70, E71, E90, N-Gage, N-Gage QD, N70, N70-1, N71, N72, N73, N75, N76, N77, N78, N79, N80-1, N81, N81 8GB, N82, N85, N90, N91, N92, N93, N93i, N95, N95 8GB, N96 . C702, C902, C905, D750, D750i, F305, F500i, G502, G700, G900, J200i, J210i, J220i, J230i, J300a, J300i, K200i, K300, K300a, K300i, K310, K310a, K310i, K320i, K500i, K508, K508c, K508i, K510a, K510i, K530i, K550i, K600, K600i, K608i, K610, K610i, K618i, K630, K660i, K700, K700c, K700i, K750, K750i, K770, K790a, K790i, K800i, K800iv, K810i, K850i, P1i, P800, P900, P910, P910a, P910i, P990i, S302, S500i, S700, S700i, S710a, T226, T230, T250i, T290a, T290i, T610, T616, T630, T637, T650i, T68, V600, V600i, V630i, W200a, W200i, W300, W300i, W350, W380, W550c, W550i, W580i, W600c, W600i, W610i, W660i, W700i, W710i, W760, W800c, W800i, W810i, W810iv, W830i, W850i, W850iv, W880i, W890i, W900i, W910i, W950i, W960, Z1010, Z200, Z300i, Z310i, Z310iv, Z500, Z500a, Z520a, Z520i, Z530i, Z550a, Z550i, Z555, Z558i, Z600, Z610i, Z710i, Z750, Z800, M600i. Motorola, Samsung and many other brands are also supported. I have problem installing the English dictionary on my Nokia 3110C. Please guide. I would be greatful if u recommend me a English to English Dictionary for Sumsung Mobile Phone.